Location: /Instruments/Banjo/THE CLIFFORD ESSEX WEAVER BANJO. DEPOSIT £500 REQUIRED. The Weaver is the ideal banjo for the classical, frailing and clawhammer styles of playing. 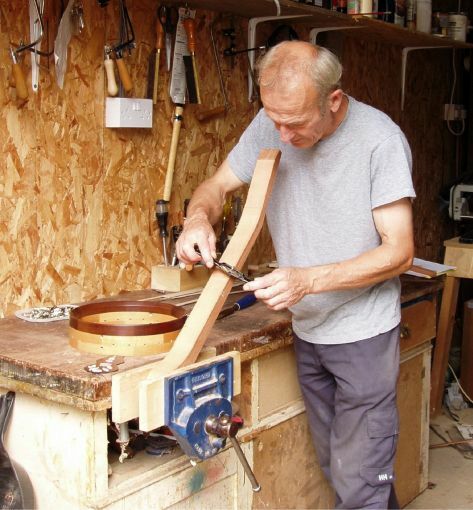 In recent years we have done a lot of research into the banjo tone ring. The finest violins, cellos, mandolins, guitars etc, do not have a metal component designed to enhance the tone. Like these instruments, our banjos are constructed of the the finest hand picked timbers, chosen for their fine acoustic qualities. 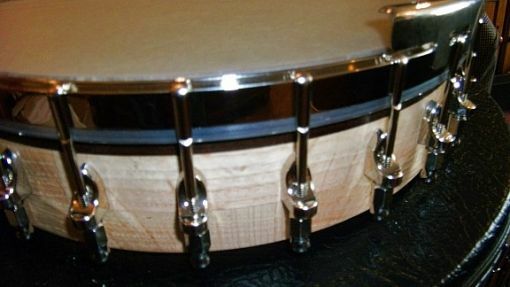 In the 1920s the metal tone ring was introduced into banjo construction by the Americans, and was quickly copied worldwide by nearly all banjo makers, including this company, with our Concert Grand and Paragon models. All manner of metal tone rings were introduced, some were just a plain metal ring, others were hollow rolled brass, some were, and still are, like a large sound chamber littered with small holes to let the sound out. This acts as an echo chamber, the problem being, given a run of notes, the note just played, rings on when the next is played, the player, no matter how skilled, is not in full control. Every player has his or her own views on how a banjo should sound. 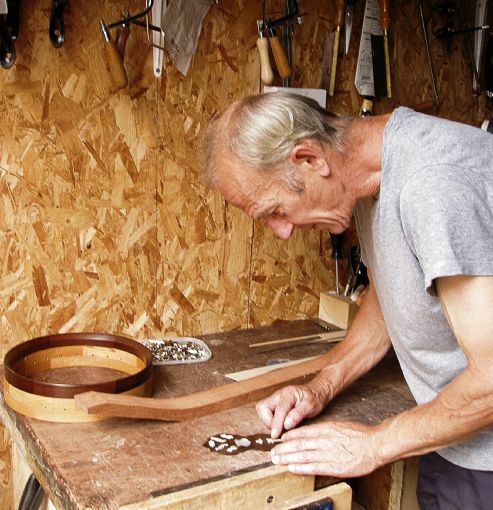 To our ears, banjos constructed with any form of metal tone ring, produce a metalic, cutting sound, that maybe exactly what you are looking for, in which case, do not buy one of our banjos. We favour the big natural woody tone produced by the high quality timber used in the construction of this instrument. The shape of the Weaver neck was designed by Alfred Weaver, long before WW1. His banjos were played by the top professionals of the day. We wanted to retain the original appearance of the instrument and chose not to fit truss rods in the neck, which would require a truss rod cover on the peghead. 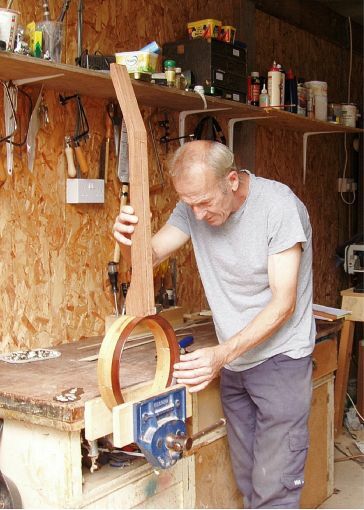 The neck is hand carved by our luthier Garry. However, to be absolutely certain that the Weaver neck can never warp, particularly in countries with very high temperatures, we have fitted an unbendable aluminium rod under the fingerboard, extending from the nut to the heel. Since aluminium is very light the Weaver retains a very fine balance. This beautiful, completely hand made banjo has a 12” hoop, 22 frets, nylon/gut strung, or we can fit a tailpiece suitable for steel strings. The hoop is made of English oak with an integrated Chakte Viga tone ring, producing a brilliant tone. The neck is mahogany, geared pegs with real ebony buttons, the position markers are plain mother of pearl or abalone dots. Width at the nut 1-5/16". Scale length 26-3/16". 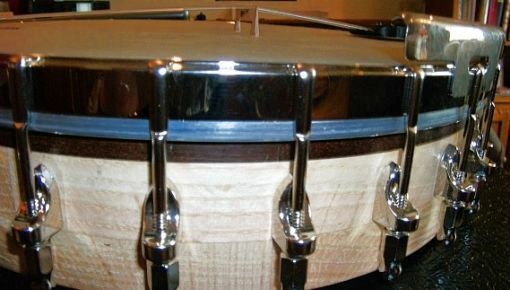 The heart of this banjo is the Chakte Viga (scientific Name: Caesalpinia Platyloba) tone ring. Chakte Viga is a tropical hardwood from Mexico. The hardwood colour varies slightly from pale to rich reddish orange/brown. Chakte Viga is sometimes referred to as Paela. The grain is typically straight, but can be interlocking. It has excellent tonal qualities and is popular in both instrument building and wood turning. 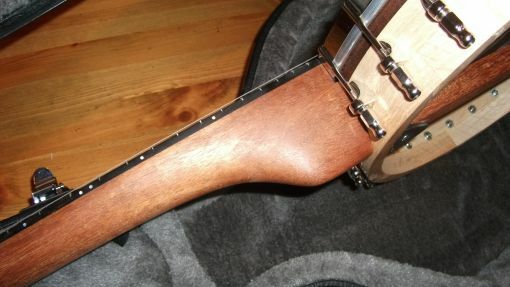 To the best of our knowledge, until now, it has never before been used in banjo construction. Just a brief message to say how happy I am with my new Weaver banjo. It has a lovely mellow tone, not too much sustain & is clear the whole fingerboard, fantastic. If you ever have any enquiries from my part of the country feel free to use my details if they want to try it thanks again. BEAT OF THE DRUM BY EMILE GRIMSHAW. PRO PATRIA BY EMILE GRIMSHAW. BLENHEIM MARCH BY CHARLES SKINNER.